Figure 1: Anatomical structures in and around the temporomandibular joints (TMJs). The jaw joints are known as the temporomandibular joints (TMJ), so named because they are the point where the temporal bone of the skull, and the mandible (lower jaw) interface. Dysfunction in the joints (TMD) includes clicking, popping, locking and grating. Each of these represents a different step along a continuous pathway of successively more-serious problems. At each step along the pathway, there may be various degrees of pain, or no pain at all. Major structures in and around the temporomandibular joint (TMJ) are shown in Figure 1. When slightly open, the condyle (3) of the lower jaw (mandible), is resting in the glenoid fossa (2), a concave depression in the temporal bone of the skull base. These are the two bony elements of the joint. In health, there is a cushioning disk between these two bones, which is attached to, and moves with the condyle. It is held in place by a fibrous joint capsule containing synovial fluid. (1) shows the external auditory meatus (earhole), an important structure because it lies so close to the joint. Sometimes TMJ pain can be felt as ear pain. (4) shows the zygomatic arch, where the masseter muscle (one of the large closing muscles of the jaw) attaches. The other end attaches at the angle of the mandible (6). Also involved in closing the jaw are the anterior fibers of the temporalis muscle, which attach at (7) and (5), the latter of which is the coronoid process of the mandible. The posterior temporalis muscle fibers move the mandible posteriorly (retrusion). At (8), muscle fibers of the lateral pterygoid muscle attach to the lateral plate of the pterygoid hamulus, a bony projection of the sphenoid bone. The lateral pterygoid muscle inserts on the anterior portion of the condylar neck. Contraction of these muscles moves the mandible forward (protrusion). (9) is the mastoid process of the temporal bone. Muscles involved in tipping and turning the head attach at this point. (10) is the coronoid notch of the mandible, an important bony landmark when giving dental injections. The TMJs are the only joints in the body that are partly rotational, and partly translational (the medical term for this is synthroathroidial). 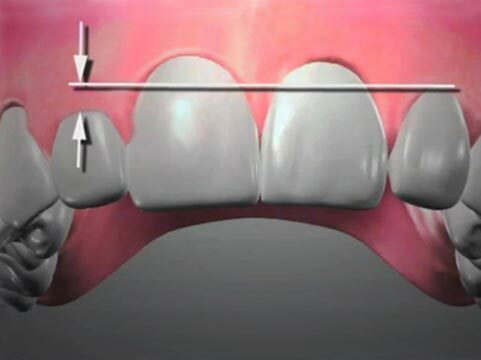 This means that for the first 10-15 millimeters of mouth opening (measured at the incisor teeth), the joints work like hinges—rotating around a stationary axis drawn between the two condyles. Opening the mouth further causes the condyles to move (or translate) down and forward, out of the glenoid fossae (Figure 2). You can appreciate this by placing your fingers over the bony humps just in front of your ear holes. Open and close as wide as you comfortably can. You will feel the hump disappear as the mandible moves forward. By moving your mandible side to side with your fingers over the humps, you will really notice the movement as the mandible skews forward on one side and backwards on the other. Figure 2: The mandible shown translated forward, with the condyle out of the glenoid fossa. Figure 2 shows the open position of the TMJ. (1) is the area of entry of the retrodiskal tissues, where the nerve and blood vessel fibers enter the joint capsule. (2) is the lateral pole of the condyle, where the joint capsule ligaments attach. The joint capsule resembles a parachute, with the shock lines representative of the joint capsule ligaments. Placing a finger over the lateral poles or in the ear and pushing forward gently with the teeth closed together will produce tenderness if there is inflammation in the joint capsules. The mandible is translated down and forward in the photograph. (3) represents the position of the posterior ramus of the mandible (4) when the jaw is closed. Heavy muscle contraction forces in the jaw closing muscles (masseters, temporalis and pterygoids) can squeeze the cushioning disk. If this happens frequently enough, the disk can distort in shape. Part of it can squeeze forward into the joint compartment and part of it backward. Depending on which direction the bulk of it goes, either the opening path of the jaw can be interfered with, or the closing path. 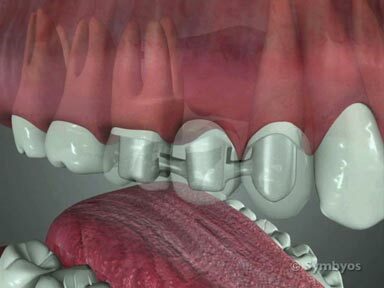 This can cause the jaw to lock either open or closed. Even normal chewing muscle forces can damage the jaw joints if several of the back teeth are lost. This is because the back teeth help to reduce the amount of force experienced by the joints, by carrying a significant portion of the load. Small, corrugated or irregular ripples that form in the articulating disk can cause clicking. Clicking can also be caused by ligament laxity, a stretching of the joint capsule ligaments that can occur with trauma or by forcing the mouth to open farther than normal. Distortion in the shape of the joint capsule is what causes popping. If the cushioning disk becomes perforated, a bone-on-bone situation like that shown in the Figures can result. Wear on the two bony elements can produce roughened surface osteophytes, bony projections which, when rubbing against each other produce grating (crepitus). This condition is known as TMJ arthritis. How does the dentist diagnose TMJ Disorders? Relative movement of the two bony components in a joint is called articulation. This movement should be fluid, and without popping, clicking, grating or locking. There should not be pain from the teeth, jaw muscles or jaw joints when the teeth are closed together. Presence of joint pain is a symptom of inflammation in the area. Was there an injury to the jaw? Forceful blows can cause fractures (most commonly at the neck or narrowest part of the condyle); tears in the fibrous joint capsule, or merely inflammation in the joint capsule. Has the patient experienced recent sinus congestion or ear ache? Due to the close proximity of these anatomical areas to the TMJs, pain in one can be felt in another. Does the patient clench or grind their teeth (bruxism)? Heavy jaw muscle contraction forces can injure the joint capsules, and/or cause inflammation in the joints. Is the patient experiencing stress? Sometimes a stressful lifestyle causes the patient to clench and grind their teeth. Often the patient is not even aware they do it, and sometimes they may do it at night. Is the patient having difficulty sleeping? This question has the same implications as stress. Is the patient missing some or all of the back teeth on the affected side? Back teeth help to support the jaw muscle closing forces, and if they are missing, the joints must absorb all of the force. Did the patient recently undergo dental treatment requiring the mouth to be opened wide, or for a prolonged period? If so, inflammation in the joints can result. Are the jaw muscles tired or sore? If so, the patient is likely clenching or grinding (bruxing) the teeth. Is the patient experiencing headaches? If the headaches originate in the temples, or radiate from the jaw closing muscles, clenching or grinding may be producing muscle fatigue and headache. Examination involves evaluation of the teeth: are there signs of heavy muscle activity, such as wear planes (attrition), chips, cracks/craze lines, or notches (abfractions) at the gum line; feeling (palpation) for pops, clicks or grating (also called crepitus); listening, either unaided or with a stethoscope, for popping, clicking or crepitus; using electronic devices to listen to the joint as it articulates; using electronic devices that measure electrical activity in the muscles; using advanced imaging techniques, such as injection of dye into the joint and producing an arthrogram. Clicking may be an early derangement of the joint capsule, the smooth crescent-shape of which may be slightly wrinkled. It can also be a sign of ligament laxity, in which case the ligaments attaching the joint capsule to the condyle may have been stretched, and are now snapping over the edge of the condyle. This may be caused by forcing the mandible to open past its ideal maximum opening, or by trauma to the mandible. Clicking may accompany any stage of jaw joint dysfunction. Popping is a sign that the joint capsule has changed shape, which generally requires a significant amount of time to occur. It is a sign of a more chronic problem. An opening pop or lock suggests that a bulge in the disk (joint capsule) has developed in the forward portion of the joint compartment, and is blocking the forward slide of the mandible needed to fully open the jaw. A closing pop or lock suggests that a bulge in the joint capsule has developed in the posterior (back) portion of the joint compartment, and is blocking the rearward return of the mandible. A reciprocal pop is one that occurs both on opening and closing, implying that the disk has bulged both forward and rearward, and instead of being crescent-shaped, now has a dumbbell shape. Grating may be a sign that a hole has been worn through the fibrous joint capsule/disk, and the condyle is now rubbing directly on the glenoid fossa of the skull base. This would generally represent a long-standing derangement of the joint. Examination also involves an assessment of pain. The dentist will generally place inward and forward pressure on the condyles when the teeth are closed to see if it causes pain. This will include placing the finger tips into the ear hole, which may seem unusual. A painful response supports a diagnosis of inflammation of the fibrous joint capsule (capsulitis). If there is no clicking, popping, grating, or locking, this is usually the earliest sign of trouble in the joints. Capsulitis may also accompany a more advanced (chronic) problem. The patient’s envelope of motion will be evaluated—can they open their mouth fully? Does the jaw deviate significantly to the left or right when opening? Is the opening restricted? Does the jaw lock, either open or closed? Electronic devices such as stethoscopes can detect sounds in the joint which may not be detectable audibly or by auscultation. The dentist will evaluate the patient’s occlusion, or how the upper teeth and lower teeth line up when the jaw muscles are at rest, and the condyle of the mandible is in a stable position in the glenoid fossa. Teeth which are improperly aligned may cause greater forces to be placed on the jaw joints, which can lead to TMD. Improper alignment of the teeth is called malocclusion. Advanced imaging techniques for evaluating the jaw joints include tomograms, arthrograms, CT scans, Magnetic Resonance Imaging (MRI) and cone beam CT scans (CBCT scans). Successful treatment of TMJ Dysfunction depends on its cause. Accurate diagnosis is critical, and in some cases symptoms may persist. Treatment for early inflammation of the TMJs may simply involve avoidance of hard, sticky foods, avoidance of full mouth opening, and taking anti-inflammatory medication until symptoms resolve. If symptoms appear more chronic (long standing), the dentist may recommend the use of an occlusal guard. Sometimes adjusting the way the patient’s teeth fit together by altering their shape with a dental handpiece (called occlusal adjustment or equilibration) can produce a more even distribution of forces on the teeth and jaw joints; and bringing the front teeth into function may reduce jaw muscle forces. If malocclusion is suspected as a contributing factor, orthodontic treatment may be indicated. Sometimes placing composite resin stops on the biting surfaces of the teeth can be performed as a diagnostic aid to see if orthodontic treatment would help. 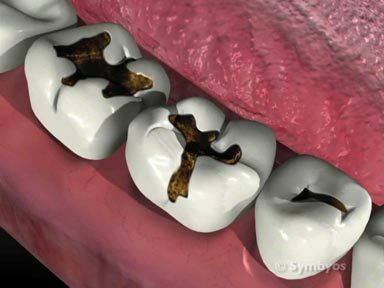 Composite resin is tooth colored filling material. It can function in the same way as an occlusal guard would, only the stops are not intended to be removable by the patient. If TMD has arisen following the loss of back teeth, replacing the teeth may be recommended. Options for this may include dentures, fixed bridges, and dental implants or combinations of these treatments. (Full mouth) dental rehabilitation involves rebuilding all of the teeth with crowns, onlays, bridges, dentures and/or dental implants, in order to establish a normal functional relationship of the teeth, jaws and jaw muscles. If dental treatment is unsuccessful at treating TMD, relief can sometimes be obtained with massage therapy or chiropractic treatments. Severe internal derangements of the jaw joints may require surgical intervention to correct. Success of surgical intervention varies.